On a recent weekend evening, we came across two young men fanning the flames of a small charcoal stove on the side of the road near Mercado San Juan in the Centro Histórico neighborhood of Mexico City. They were making tlayudas, the signature Oaxacan dish, and already had a pair of traffic cops waiting in line. 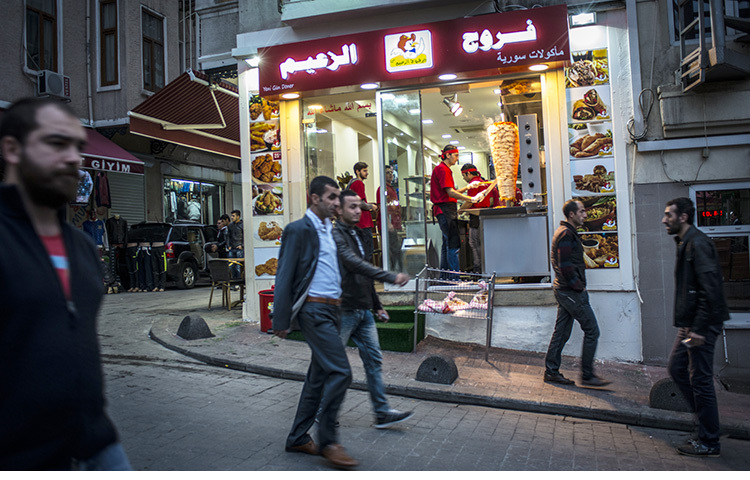 The smell of melting cheese and fresh tasajo, dried, smoked beef, was enough to convince us to join the queue. A tlayuda is a wide, crunchy tortilla filled with meat, cheese and beans. The young men had brought the ingredients fresh from their hometown in Oaxaca’s Sierra Norte. Combining Oaxacan cheese; chewy, salty tasajo; avocado; and a thick layer of mashed beans, the tlayuda was simple and delicious. This staple comfort food is one of many included under the catchall phrase “Vitamina T,” which refers to the many “T”-named foods – tlayudas, tortas, tacos, tamales and more – that provide a big nutritional bang for your buck. 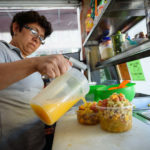 Some might guess, looking at the new restaurants opening left and right in tourist-packed neighborhoods like Roma and Condesa, many with names in English and menus boasting international dishes, that the prevalence and importance of “Vitamina T” foods, often consumed at small informal spots and impromptu street stands, are waning. The story is never that simple in Mexico City, though. The city’s culinary identity is certainly changing, thanks in large part to the boom in tourism. Yet this is only the most recent factor to shape how Mexico City is eating; shifting demographics, urbanization, property development, international economic policies and the ebb and flow of crime in the city have all molded a dining scene that is, on the one hand, catering to foreign tastes while, on the other, elevating traditional Mexican cooking techniques and dishes that were considered old-fashioned. Like Mexico City itself, the Mexican capital’s food scene is caught between several opposing forces: convenience versus slow cooking, home-grown versus imported, tradition versus innovation. For many years, Mexico City was hardly an international destination; starting in the 1970s, the federal government was more focused on promoting beach destinations like Acapulco, Cancun and Los Cabos. Moreover, the city’s reputation suffered through years of high crime in the 1980s and 1990s and the devastation of the 1985 earthquake, which leveled many parts of Mexico City. In the early 2000s, left-leaning mayor Andres Manuel Lopez Obrador (now Mexico’s president) invested heavily in the city’s historic downtown, attracting visitors who had long avoided the area. But another set back came with the drug war launched in 2006; Mexico City was largely removed from the violence, but headlines about bloody cartel confrontations around Mexico turned many tourists away. During that time, those familiar with Mexico City’s world-class museums, restaurants and lively neighborhoods felt like they were in possession of a well-kept secret. But more and more people visiting the city realized it wasn’t the gritty, dangerous capital they had imagined. Recent accolades from The New York Times, National Geographic and a host of travel shows have only increased the hype. 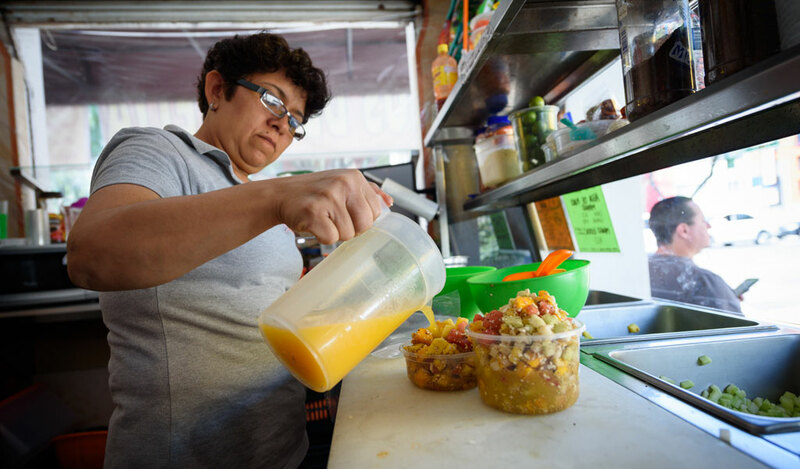 And Alfonso Cuarón’s new Oscar-award-winning film Roma (2018) and its breakout star Yalitza Aparicio are drawing even more attention to the capital and the eponymous neighborhood. On the culinary side of things, high-end Mexico City restaurants like Pujol and Contramar have become must-visit destinations for visiting gastronauts and regular fixtures on annual regional and global “Best Restaurants” lists. Mexico City chefs have even become something of a bankable commodity: Pujol’s Enrique Olvera has opened a successful restaurant in New York, while two other chefs – Alam Méndez of the Oaxaca-inspired Pasillo de Humo and Gerardo Vázquez Lugo of Nicos, a family-run shrine to traditional Mexican cooking – have both been recruited to oversee the menu creation and opening of restaurants in the Washington, DC, area. 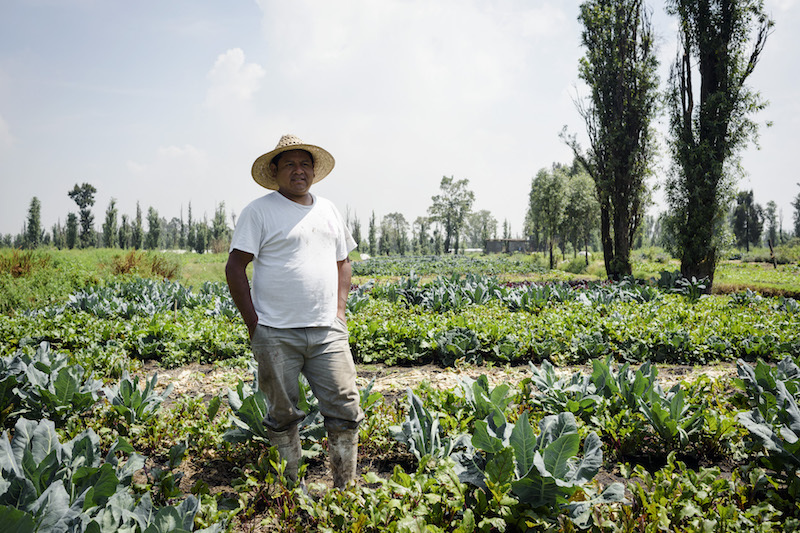 Will everyday Mexicans benefit from this resurgence of traditional Mexican cuisine and small-scale agriculture? Meanwhile, the way tourists experience Mexico City is changing: Airbnb, Uber and TripAdvisor are taking much of the guess work out of visiting what used to be considered a destination for only the most intrepid travelers. Uber in particular has demystified the city for visitors who are hesitant to take the Metro or fear crime at the hands of taxi drivers (which had plummeted long before Uber came around). 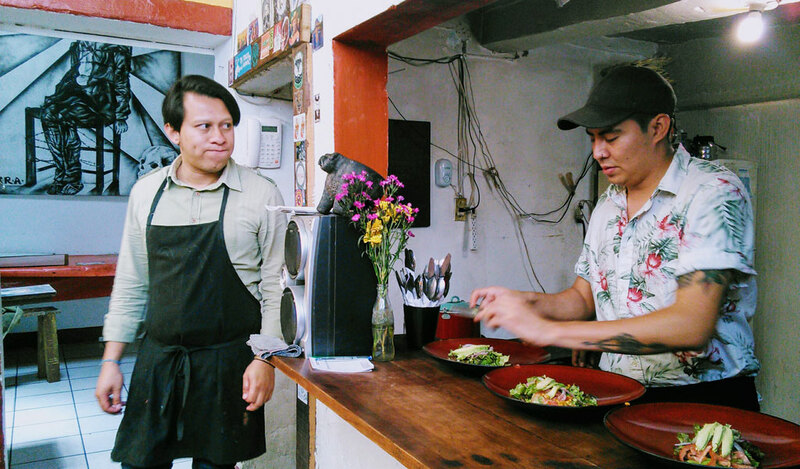 The boom in Mexican tourism has both accompanied and helped push forward a renaissance of chefs exploring traditional ingredients and supporting the small-scale farmers who produce them. 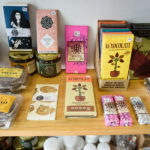 A number of newer initiatives like Maizajo and Yolcan now connect urban dwellers with rural producers – they are reestablishing ties that were severed due to a change in demographics and trade policy. More specifically, the country experienced rapid urbanization in the second half of the 20th century, which means that most Mexicans live in cities nowadays. 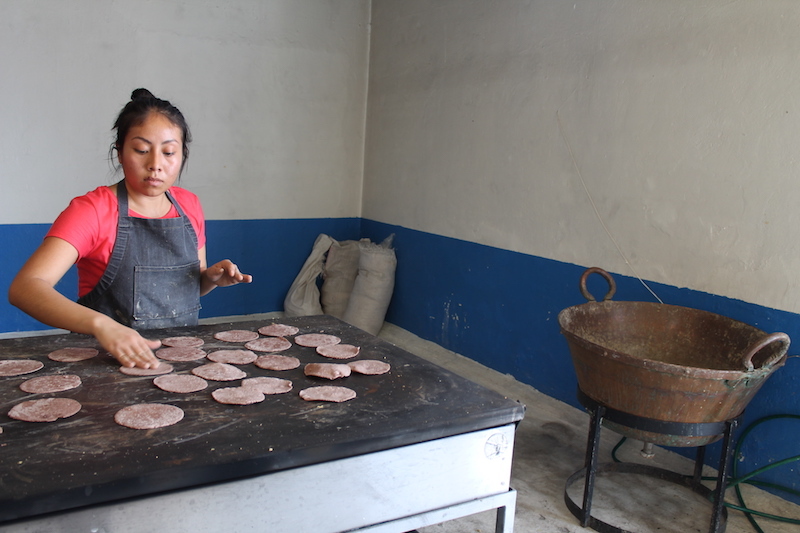 Traditions like nixtamalización, cooking corn with lime to grind it for tortillas, declined as more women entered the workforce and fewer families worked in agriculture. Gálvez’s new book, Eating NAFTA, elaborates on this argument. Mexico City’s population burgeoned throughout the 1990s as the countryside emptied out. People brought their food with them: in Mexico City you can find regional dishes from states Guerrero, Veracruz, Hidalgo and Puebla. 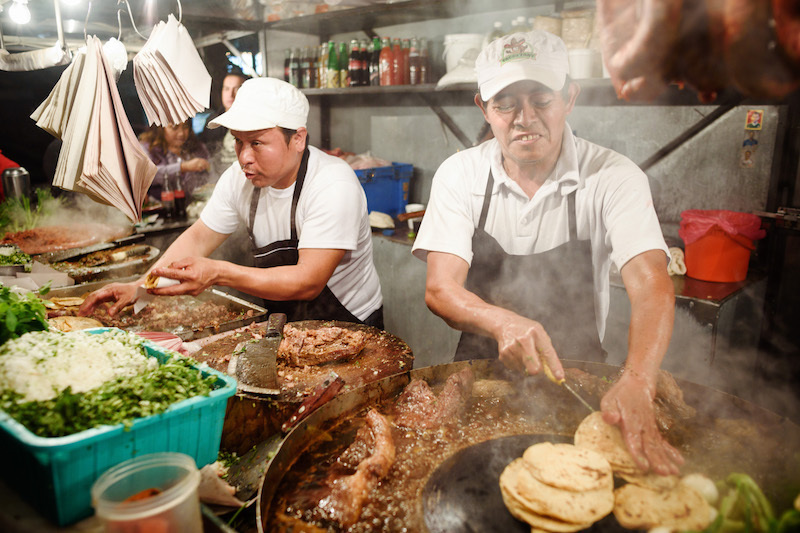 With such a wide variety of cuisines and a new interest in traditional dishes, as well as a growing population of tourists and locals interested in eating well, it might seem like a golden moment for Mexico City’s food scene. Yet the pressures are mounting. First and foremost, recent spikes in crime are causing concern that Mexico City may no longer be a “bubble” protected from the violence devastating other parts of the country. While the drug war captures fewer headlines these days, 2018 had Mexico’s highest homicide rate on record (with most of that violence taking place outside of Mexico City). Still, during Mayor Miguel Angel Mancera’s term from 2012 to 2018, homicides went up 22 percent, a worrying trend that the municipal administration has promised to tackle. Meanwhile, the city’s housing stock is strained, pushing rents up for both apartment hunters and restaurant owners. The rise of Airbnb has certainly made housing scare. 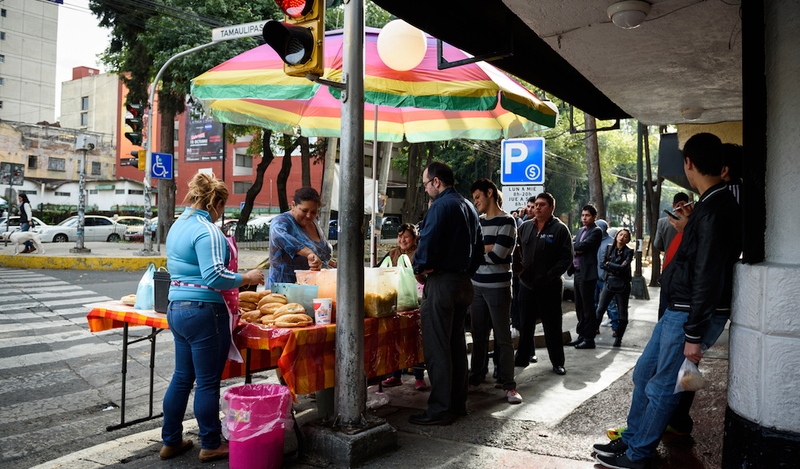 Plus, young Mexicans in the capital region now prefer to live in Mexico City, after seeing their parents’ generation suffer through long commutes from far-flung suburban developments. Restaurants and bars popped up to cater to the influx of both locals and tourists. While rents shot up in neighborhoods like Roma, Condesa, Juarez and San Rafael, long-term residents and business owners were pushed out. The southwest corner of the Central Alameda encapsulates these tensions between working-class Mexico City and high-end developments. 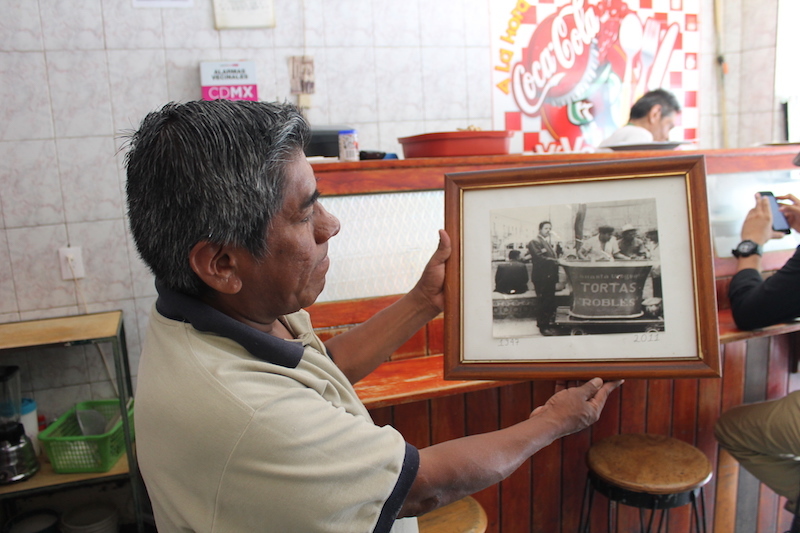 Last year we profiled Tortas Robles in its fight to stay in the historic Trevi building. Just around the corner is Barrio Alameda, a recent development project that includes a high-end food court and boutique shops. Tortas Robles and its neighbor, Cafeteria Trevi, have managed to stay in the building so far. But future development in Centro Histórico threatens these multi-generational family businesses. 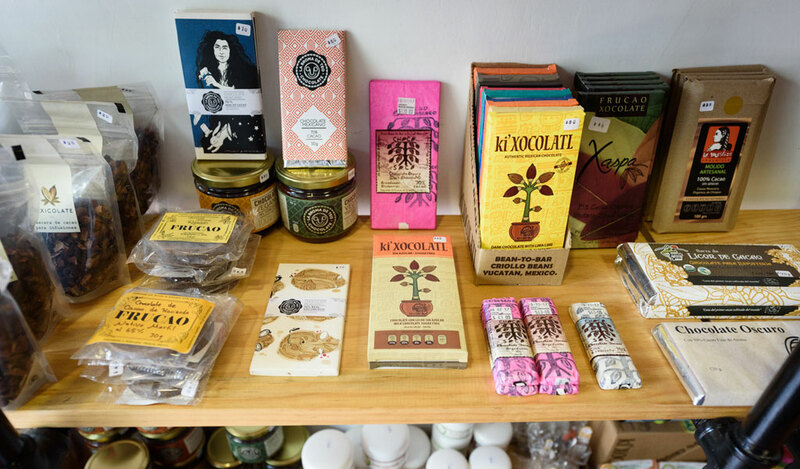 As Mexico City grapples with a changing urban landscape and the culinary world caters to the city’s new arrivals, the question now is whether everyday Mexicans will benefit from this resurgence of traditional Mexican cuisine and small-scale agriculture. Could native corn go the way of quinoa, which became unaffordable for many local consumers in Peru and Bolivia when it became trendy abroad? Residents of Mexico City work long hours, suffer through endless commutes and pinch pennies as cost of living goes up and wages stagnant. Paying extra for locally grown food or making labor-intensive corn-based dishes isn’t always an option. But Mexico City’s markets give us hope; throngs of shoppers still weave through the crowded rows of stalls at La Merced, Mercado Jamaica, the Central de Abastos and dozens of other markets and tianguis around the city. They pick out the freshest ingredients brought in from around the country to home-cook family recipes that have been handed down from generation to generation. If the top 10 lists and Yelp reviews get to be too much, it’s always worth ducking into a market and getting lost in the stalls until you stumble on something that looks good. As for those two young men making tlayudas, we’ve passed by a few times in the weeks since but haven’t seen them or their makeshift food stand again. 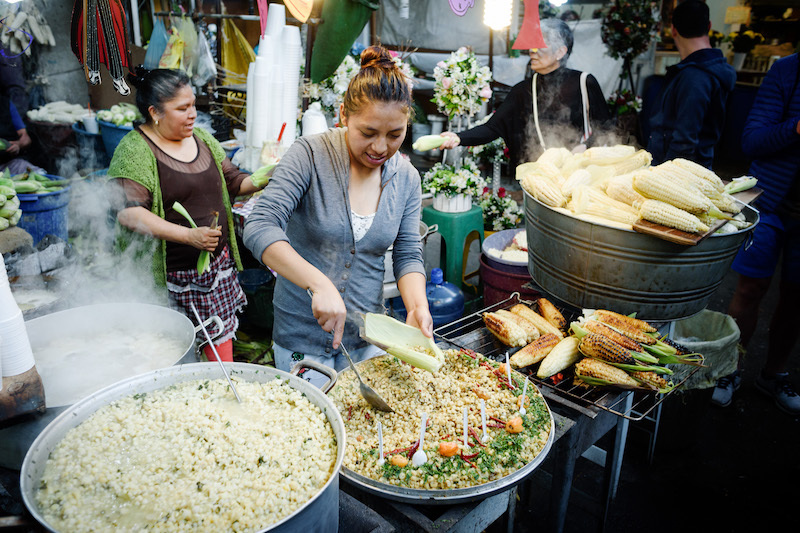 Like some of the best culinary experiences in Mexico City, it might never be repeated. 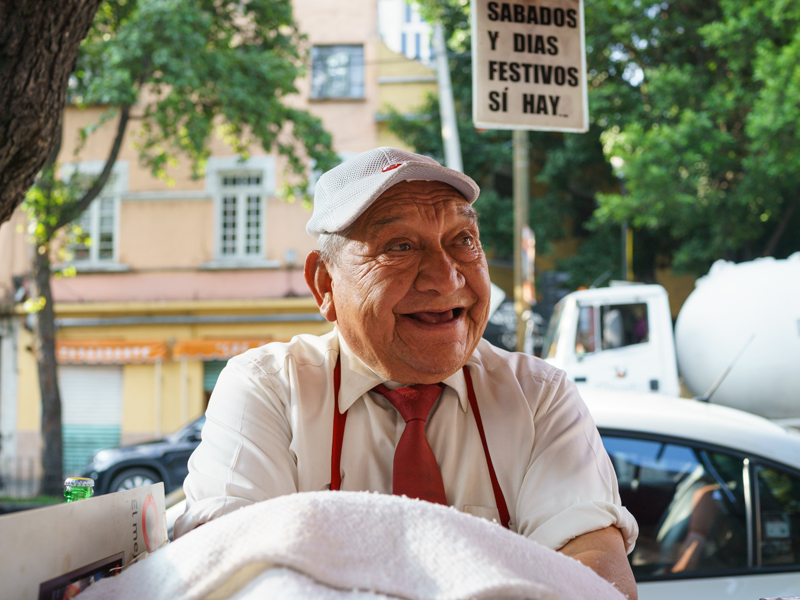 Yet there’s one thing we’re certain of, despite the rapid changes taking place in Mexico City – there will always be another spot like theirs just around the corner. 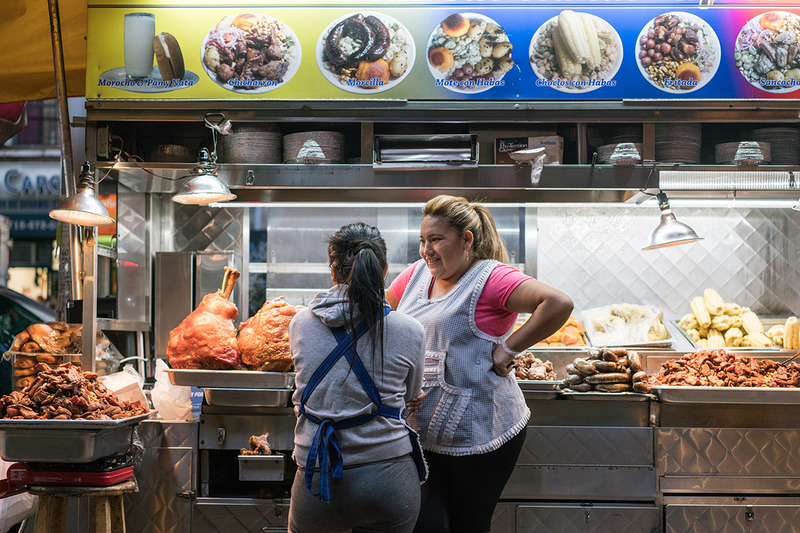 Editor’s note: Traditionally we have published State of the Stomach pieces when beginning coverage of a new city, to provide an introduction to its food culture and how it shapes daily life. But as we dive deeper into the cities we work in, we’re taking stock of what’s changed, particularly as internal and external factors reshape both the culinary and urban landscape. So we thought it was worthwhile to reexamine how some of these cities are eating, which will inform our coverage going forward.